Celtic warmed up for their Champions League clash with Barcelona by putting five past Kilmarnock. The home side are still without a win this season. Despite Killie starting better in the first half, Celtic took the lead. It was a Samson mistake when his poor punch landed at the feet of Commons who knocked the ball into the net. The second came when Samaras picked the ball up on the left-hand side before expertly finishing with a curling side-foot finish. Two minutes later, it was Samaras and Commons at the heart of Celtic’s third. They played a nice one-two before Samaras slid the ball home to effectively win the game. Killie cut the deficit, Sammy Clingan scored a great free-kick after Van Dijk had fouled Gardyne. Just before half-time Killie were right back in it. Clohessey and Clingan played the one-two before the right-back shot low past Forster to make it 3-2 at the break. The second period wasn’t much to write home about, Pukki clipped the bar 66 minutes in. Nothing much else happened until two minutes from time when Samaras headed his hat-trick from Mulgrew’s free-kick delivery. With a minute to go Amido Balde scored from a tight angle to score his first in a Celtic shirt. Caley maintained their 100% home record after an easy win over a poor Hibs side. It took just ten minutes for the hosts to take the lead. Caley captain Richie Foran sent Shinnie away down the left, his cross was fumbled by Williams; only for McKay to be on hand to find the net. Caley almost doubled the lead, Vincent freed McKay, but the Ulsterman shot wide of Williams’ far post. Hibs’ best chance of the half was through Heffernan he latched on to Liam Craig’s flick-on but he fired wide. 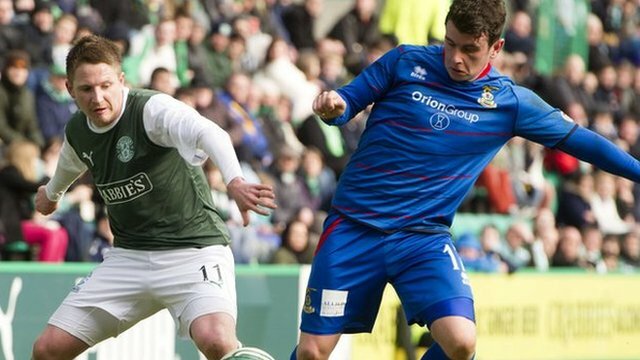 The hosts started better in the second period, it was Hibs who had the first meaningful effort. Tom Taiwo flashed his shot over from a Liam Craig corner. For the home side McKay came close, he was played in by Ross Draper only to shoot over. The second came just shy of the hour; Doran’s cross was headed back across goal by Greenhalgh for Foran to drill home. The third came just minutes later McKay’s curling effort beat the helpless Williams in the Hibs goal. McKay came close on a few occasions but he was unable to grab his hat-trick. It wasn’t the best start for the home side when thistle struck after just six minutes. Saints defender Anderson slipped allowing Bannigan to play in Doolan, who rounded the goalkeeper before coolly rolling the ball in from a tight angle. Dave McKay’s free-kick was saved by Gallacher and Mannus did well to prevent Doolan adding to his strike. Just minutes before half-time St Johnstone equalised through McLean. He found himself some space in the box before firing a low shot into the bottom corner. Saints almost took the lead seven minutes after half-time. O’Donnell had to slide in and clear Stevie May’s effort. Gallacher pulled off a good save to deny Chris Millar from 18 yards out. Thistle had a clever move when the pairing of Craigen and Doolan outfoxed the home defence only for Doolan to waste the chance. Dave McKay should have won it late on but his shot from McLean’s low cross was easily saved. Motherwell continued their good form beating inconsistent Ross County 3-1 at Fir Park. Motherwell started better in this match, they had three early chances, through Francis-Angol, Anier and Hutchinson but none of them could find the net. County threatened through Graham Carey before taking the lead on the half-hour mark. Carey held the ball up and released Gordon down the left his cutback found De Leeuw whose effort went in off the post. Motherwell had a further three efforts from set-pieces but went in behind at the break. De Leeuw had the first effort after the restart but could not convert. Motherwell equalised when Sutton headed home Ainsworth’s corner-kick. Anier then headed wide from an Ainsworth cross, while Brittain and Kettlewell went close for the visitors. Motherwell took the lead when Anier played Sutton through and the Englishman fired high into the net beyond Brown. Bob McHugh 13 minutes from time Motherwell sealed the win after heading home Ramsden’s diagonal pass. Hearts and Dundee United didn’t share any goals but were involved in an incident-packed encounter at Tynecastle. In an even first half, Hearts started better. Dundee United ‘keeper Cierzniak saved Jason Holt’s low drive. United hit back but Goodwillie’s effort could only find the side-netting. After Smith’s long-rage effort United had three chances through Armstrong two from him and one from Rankin. Ciftci had the ball in the next but the ref had already blown for a foul by Goodwillie. Hamil was next to go close but his effort from long range was saved. Danny Wilson then headed over from McHattie’s corner. Hearts had a goal chalked off; Patterson’s long throw was missed by the ‘keeper for McGowan to tap it in but it was ruled out for a push. The second half began with MacDonald beating away a Ciftci effort after Hamil’s slip in midfield. Rankin should have done better with his next effort but he fired straight at MacDonald. Ciftci hit the post from with his first-time effort from 18 yards out. Wilson’s header went close from Walker’s corner but neither could break the deadlock. Aberdeen managed to deny St Mirren their first win of the season with a late goal. In the live Monday night fixture. Aberdeen started better, Calvin Zola’s shot went out for a corner but it came to nothing. St Mirren goalkeeper Dilo then easily gathered Vernon’s header. McGinn stung the hands of Langfield before half-time. Nine minutes after the restart the home side took the lead. McGowan crossed from the left, which Thompson controlled before finding the net, to the delight of the home fans. Johnny Hayes almost had Aberdeen level straight away but Dilo did well to stop his hard-hitting free-kick. Kenny McLean’s effort went wide as he almost doubled the St Mirren lead. Dilo pushed Niall McGinn’s effort to the post. Aberdeen drew level, when Considine met Hayes’ corner his shot was blocked, only for Pawlett to get to rebound to knock the ball home for a share of the points.